It was a phenomenon called the "Norway Spiral." Some reports labeled it a Star Gate or a wormhole. On December 9, 2009 a majestic white spiral and blue light twirled in the morning skies over Norway. Here’s the best video. Did Supreme Court Ruling Give Corporations Control of U S elections? The Supreme Court just gave corporate America the go ahead to fund campaign ads for the candidate of their choice with no limit on spending. While the Supreme Court believes their decision was fair, they neglected to consider the fact that personal donations to campaigns are still limited. Keith Olberman bought up some interesting points as to how this new law can affect our entire political system and our democracy as a whole. Watch the video and consider his report. That is the date of the first shots fired at Lexington in the Revolutionary War. And it is also the anniversary of the fiery end of the government siege in Waco and the 1995 Oklahoma City bombing." “We are in the midst of one of the most significant right-wing populist rebellions in United States history,” Chip Berlet, a veteran analyst of the American radical right, wrote earlier this year. "We see around us a series of overlapping social and political movements populated by people [who are] angry, resentful, and full of anxiety. They are raging against the machinery of the federal bureaucracy and liberal government programs and policies including health care, reform of immigration and labor laws, abortion, and gay marriage." The signs of growing radicalization are everywhere. Armed men have come to Obama speeches bearing signs suggesting that the "tree of liberty" needs to be "watered" with "the blood of tyrants." The Conservative Political Action Conference held this February was co-sponsored by groups like the John Birch Society, which believes President Eisenhower was a Communist agent, and Oath Keepers, a Patriot outfit formed last year that suggests, in thinly veiled language, that the government has secret plans to declare martial law and intern patriotic Americans in concentration camps. Politicians pandering to the antigovernment right in 37 states have introduced "Tenth Amendment Resolutions," based on the constitutional provision keeping all powers not explicitly given to the federal government with the states. And, at the "A Well Regulated Militia" website, a recent discussion of how to build "clandestine safe houses" to stay clear of the federal government included a conversation about how mass murderers like Timothy McVeigh and Olympics bomber Eric Rudolph were supposedly betrayed at such houses. organizations that go beyond mere advocacy of restrictive immigration policy to actually confront or harass suspected immigrants — jumped from 173 groups in 2008 to 309 last year. Virtually all of these vigilante groups have appeared since the spring of 2005. Already there are signs of similar violence emanating from the radical right. Since the installation of Barack Obama, right-wing extremists have murdered six law enforcement officers. is charged with murdering two black people and planning to kill as many Jews as possible on the day after Obama’s inauguration. Most recently, a rash of individuals with antigovernment, survivalist or racist views have been arrested in a series of bomb cases. As the movement has exploded, so has the reach of its ideas, aided and abetted by commentators and politicians in the ostensible mainstream. While in the 1990s, the movement got good reviews from a few lawmakers and talk-radio hosts, some of its central ideas today are being plugged by people with far larger audiences like FOX News’ Glenn Beck and U.S. Rep. Michele Bachmann (R-Minn). Beck, for instance, re-popularized a key Patriot conspiracy theory — the charge that FEMA is secretly running concentration camps — before finally “debunking” it. Last year also experienced levels of cross-pollination between different sectors of the radical right not seen in years. Nativist activists increasingly adopted the ideas of the Patriots; racist rants against Obama and others coursed through the Patriot movement; and conspiracy theories involving the government appeared in all kinds of right-wing venues. A good example is the upcoming Second Amendment March in Washington, D.C. The website promoting the march is topped by a picture of a colonial militiaman, and key supporters include Larry Pratt, a long-time militia enthusiast with connections to white supremacists, and Richard Mack, a conspiracy-mongering former sheriff associated with the Patriot group Oath Keepers. Will California Legalize marijuana? --"ain't it high time?" "A single joint smoked by Amir Varick Amma cost him an additional 5 years in prison, and taxpayers roughly $250,000." We can hope that California, the state "where the future is born," will lead the way and vote to legalize marijuana this fall. What are the medical benefits of ALCOHOL? What are the medical benefits of TOBACCO? 1. It has medical benefits for cancer patients and others in severe pain. 2. It is essentially a victimless crime and, once legalized, no crimes will be even tangentially related to the cultivation, production, sale and use of marijuana. 3. The costs of incarcerating a person for smoking marijuana are huge and going from State budgets into the pockets of corporations who make large profits. 5. It redirects the money that goes to organized crime and puts it into Federal and State budgets for positive use. Let's take the laws that are already on the books for ALCOHOL, substitute the word "MARIJUANA" for "ALCOHOL and, with a few more minor tweaks, get the legal issues settled. Most people are fine with a few beers or a few glasses of wine, but, once they get into high alcohol content beverages--whiskey, vodka, gin, etc--it's "Katy bar the door!" If you are worried about your children, the same laws that apply to alcohol (age limits, driving while under the influence, etc.) will apply to marijuana. Oh, BTW, have you checked your medicine cabinet, or where ever you keep your prescription drugs lately? Once upon a time ALCOHOL was the Big Social Evil; society tried to prohibit it and that spawned organized crime, increases in law enforcement expenses, and put the profits into the coffers of Al Capone and his cohorts. Then, ALCOHOL was legalized and all the money collected from taxes, the money spent on law enforcement, and the money spent on incarceration reversed flow from taxpayers LOSING huge sums to taxpayers GAINING funds to put to positive social purposes. Legalize marijuana--"ain't it high time?" In 1992 Anthony Williams, now known as Amir Varick Amma, was sentenced to 25 years to life for a non-violent drug offense under the Rockefeller Drug Laws. Amir was convicted of two felonies, the worst of which was the sale of 2 ounces of cocaine in Albany County. Amir was badly assaulted by the police when he refused to give up his accomplices. His refusal to cooperate guided Judge Keegan to sentence him to 12 and a half years to life on each charge, meaning he had to serve 25 years. Most judges would have incorporated the two charges together, resulting in a 12-and-a-half-year sentence. But Keegan was a "hang 'em high" judge, part of a tightly knit crew of upstate judges that dished out extraordinary sentences for drug offenders. Amir challenged his conviction, but lost every legal challenge he pursued. On the outside, Amir's greatest supporter was his mother Queen Nazimova Varick. Over the years she fought tooth and nail to get her son out of prison. She joined the Mothers of the NY Disappeared, a leading activist group that fought the draconian Rockefeller Drug Laws for many years. She was suffering from several ailments, including cancer, but she never gave up hope that her son would return home to her, although his continued incarceration made her healing process all the more difficult. In 2004, the legislature passed some incremental Rockefeller reforms that would help individuals like Amir who were sentenced to extraordinary amounts of time. Amir filed an application only to be denied. The judge could not even address his motion because he had been busted for smoking a joint while in prison. For this they gave Amir 60 days in solitary confinement and took away his merit time, rendering him ineligible for judicial relief under the new reforms of 2004. Activists quickly rallied together to seek justice for Amir, but to no avail. Amir then filed for executive clemency, but his application was denied by Gov. Paterson. Amir did not give up hope. In 2009, under the new Rockefeller reforms that were championed by Gov. Paterson, Amir was finally granted his freedom. On March 23, 2010, after 19 years in prison, Amir was released. He came by my office and I hugged him. I shared a laugh with him when he showed me a check he had received, issued by the prison from their parole release funds in the amount of 83 cents. What the hell was he suppose to do with that check, I asked. When I telephoned Albany County District attorney David Soares and asked him his opinion of Amir's case, he described it as a travesty of justice. In this time of economic crisis in New York State, when politicians are looking for solutions to reduce the budget deficit, they need look no further than the state's correctional system. That single joint Amir smoked cost him an additional 5 years in prison, and taxpayers roughly $250,000. Was it worth keeping him in prison and punishing him for an additional 5 years after serving 14 years for a first time non-violent crime? How many other Amirs are wasting away in our gulags? To reduce the budget deficit, law makers need to take a good look at our criminal justice system and how punitive methods of incarceration waste not only billions of dollars, but also human lives. Hate Monger Coulter Whines, Cancels Campus Rant - Lamebore: "Our Side doesn't do this..."
Conservative commentators were atwitter last week following news that Ann Coulter's speech at the University of Ottawa was canceled in the face of protests. Of course, Coulter has the right to speak her mind on campuses. But in announcing the cancellation, her conservative Canadian sponsor, pundit Ezra Levant, put the blame on out-of-control liberals who had allegedly made it unsafe for Coulter to speak, breathlessly telling reporters that "the police and the security have advised that it would be physically dangerous for Ann Coulter to proceed with this event and for others to come in" and stressing the presence of an "unruly mob" outside. Naturally, right-wing bloggers south of the Canadian border then went ballistic. Gateway Pundit claimed a menacing mob of 2,000, armed with "rocks and sticks," had surrounded the Ottawa campus building where Coulter was to speak. And yes, a fire alarm was even pulled. The hysterical hand-wringing was predictable. But the real stunner last week was watching the same conservatives who fretted over Coulter's safety then turn around and excuse and rationalize actual right-wing violence and intimidation stateside in the wake of the historic health care vote. Speaking out of both sides of their mouths with astonishing ease, conservatives denounced liberals who protested Coulter's appearance in Canada, and then played defense on behalf of marauding right-wing radicals who unleashed death threats, threw bricks through office windows, and hurled epithets at politicians. All in the name of saving America from President Obama's brand of evil socialism. Note how so many embraced the frightening notion that because conservatives didn't like health care reform, the violence was expected and nobody should have been surprised because Democrats, by passing the bill (i.e. desecrating the Constitution), pushed people too far. "So why are people angry? "asked Fox News' Steve Doocy last week. "Maybe because they didn't want this bill?" And that's where the fear of the perpetual angry mob comes in, and perhaps why Fox News, rather than lamenting the ugly and cowardly eruptions, seems to be encouraging it, or at least rationalizing it. Perhaps Fox News wants that threat of mob intimidation on the table, and Fox News, the de factoOpposition Party, wants Democrats to be thinking about the political consequences of further upsetting that unhinged mob. Rep. Bart Stupak (D-MI) was the target of threatening faxes and phone calls, including death threats. Some of the faxes included "racial epithets used in reference to President Obama,"according to CBS News. "Vandals also smashed the front door and a window at Rep. Gabrielle Giffords' office in Tucson early Monday, hours after the Arizona Democrat voted for the health care reform package,"reported the Kansas City Star. "Long War" Pentagon Strategy: Ready for War for the next 80 years? Our Government Is Planning to Stay at War for the Next 80 Years -- Anyone Got a Problem with That? Without public debate and without congressional hearings, a segment of the Pentagon and fellow travelers have embraced a doctrine known as the Long War, which projects an "arc of instability" caused by insurgent groups from Europe to South Asia that will last between 50 and 80 years. According to one of its architects, Iraq, Afghanistan and Pakistan are just "small wars in the midst of a big one." Consider the audacity of such an idea. An 80-year undeclared war would entangle 20 future presidential terms stretching far into the future of voters not yet born. The American death toll in Iraq and Afghanistan now approaches 5,000, with the number of wounded a multiple many times greater. Including the American dead from 9/11, that's 8,000 dead so far in the first decade of the Long War. And if the American armed forces are stretched thin today, try to conceive of seven more decades of combat. The costs are unimaginable too. According to economists Joseph E. Stiglitz and Linda Bilmes, Iraq alone will be a $3-trillion war. Those costs, and the other deficit spending of recent years, yield "virtually no room for new domestic initiatives for Mr. Obama or his successors," according to a New York Times budget analysis in February. Continued deficit financing for the Long War will rob today's younger generation of resources for their future. The term "Long War" was first applied to America's post-9/11 conflicts in 2004 by Gen. John P. Abizaid, then head of U.S. Central Command, and by the retiring chairman of the Joint Chiefs of State, Gen. Richard B. Myers, in 2005. According to David Kilcullen, a top counterinsurgency advisor to Army Gen. David H. Petraeus and a proponent of the Long War doctrine, the concept was polished in "a series of windowless offices deep inside the Pentagon" by a small team that successfully lobbied to incorporate the term into the 2006 Quadrennial Defense Review, the nation's long-term military blueprint. President George W. Bush declared in his 2006 State of the Union message that "our own generation is in a long war against a determined enemy." The concept has quietly gained credence. Washington Post reporter-turned-author Thomas E. Ricks used "The Long War" as the title for the epilogue of his 2009 book on Iraq, in which he predicted that the U.S. was only halfway through the combat phase there. It has crept into legal language. Federal Appeals Court Judge Janice Rogers Brown, a darling of the American right, recently ruled in favor of holding detainees permanently because otherwise, "each successful campaign of a long war would trigger an obligation to release Taliban fighters captured in earlier clashes." Among defense analysts, Andrew J. Bacevich, a Vietnam veteran who teaches at Boston University, is the leading critic of the Long War doctrine, criticizing its origins among a "small, self-perpetuating, self-anointed group of specialists" who view public opinion "as something to manipulate" if they take it into consideration at all. The Long War has momentum, though the term is absent from the 2010 Quadrennial Defense Review unveiled by Defense Secretary Robert M. Gates in February. One commentator has noted the review's apparent preference for finishing "our current wars before thinking about the next." Still we fight wars that bleed into each other without clear end points. Political divisions in Iraq threaten to derail the complete withdrawal of U.S. troops scheduled for 2012. As troop levels decline in Iraq, they grow to 100,000 in Afghanistan, where envoy Richard C. Holbrooke famously says we'll know success "when we see it." The Afghan war has driven Al Qaeda into Pakistan, where U.S. intelligence officers covertly collaborate with the Pakastani military. Lately our special forces have stepped up covert operations in Yemen. It never ends. British security expert Peter Neumann at King's College has said that Europe is a "nerve center" of global jihad because of underground terrorists in havens protected by civil liberties laws. Could that mean NATO will have to occupy Europe? * What is the role of the Long War idea in United States' policy now? Can the Pentagon or president impose such war-making decisions without debate and congressional ratification? * Who exactly is the enemy in a Long War? Is Al Qaeda (or "Islamic fundamentalism") considered to be a unitary enemy like the "international communist conspiracy" was supposed to be? Can a Long War be waged with only a blanket authorization against every decentralized group lodged in countries from Europe to South Asia? * Above all, what will a Long War cost in terms of American tax dollars, American lives and American respect in the world? Is it sustainable? If not, what are the alternatives? President Obama has implied his own disagreement with the Long War doctrine without openly repudiating the term. He has pledged to remove all U.S. troops from Iraq by 2012, differing with those like Ricks who predict continuing combat, resulting in a Korean-style occupation. Obama also pledges to "begin" American troop withdrawals from Afghanistan by summer 2011, in contrast to those who demand we remain until an undefined victory. Obama told West Point cadets that "our troop commitment in Afghanistan cannot be open-ended, because the nation that I'm most interested in building is our own." Those are naive expectations to neoconservatives and to some in the Pentagon for whom the Long War fills a vacuum left by the end of the Cold War. They will try to trap Obama in a Long War by demanding permanent bases in Iraq, slowing American withdrawals from Afghanistan to a trickle and defending secret operations in Pakistan. Where violence flares, he will be blamed for disengaging prematurely. Where situations stabilize, he will be counseled it's because we keep boots on the ground. We will keep spending dollars we don't have on wars without end. The underlying issues should be debated now, before the future itself has been drafted for war. Tom Hayden was a leader of the student, civil rights, peace and environmental movements of the 1960s. He served 18 years in the California legislature, where he chaired labor, higher education and natural resources committees. He is the author of ten books, including "Street Wars" (New Press, 2004). He is a professor at Occidental College, Los Angeles, and was a visiting fellow at Harvard's Institute of Politics last fall. Common toads can predict imminent earthquakes; a colony of Bufo bufos hopped it before the major quake which hit L'Aquila, Italy on 6 April 2009. The BBC explains that the males' behaviour was "highly unusual", since "once they have bred, they normally remain active in large numbers at breeding sites until spawning has finished". In this case, "spawning had barely begun at the San Ruffino Lake site before the earthquake struck". Cows, however, don't appear to share the same talent. Back in 2008, Swedish scientists discovered that local ruminants were unmoved by a quake which shook southern Sweden, leading one disappointed boffin to conclude that "as a species, cows are not the world’s most earthquake-sensitive animals"
Dr Rachel Grant of the Open University was routinely monitoring a Bufo bufo population at San Ruffino Lake, some 74km from the epicentre of the event. Five days before the 6.3-magnitude quake, "the number of male common toads in the breeding colony fell by 96 per cent", while "most breeding pairs and males fled" three days before the earth moved. Grant also noted that spawning at the site ceased "from the first main shock to the last aftershock". She believes the toads escaped to higher ground "possibly where they would be at less risk from rock falls, landslides and flooding", and their exodus coincided with "disruptions in the ionosphere, the uppermost electromagnetic layer of the earth's atmosphere", which scientists detected around 6 April using very low frequency (VLF) radio sounding. The Beeb explains: "Such changes to the atmosphere have in turn been linked by some scientists to the release of radon gas, or gravity waves, prior to an earthquake." A slow-down of the Gulf Stream, as dramatized in the movie The Day After Tomorrow, is projected by some models of climate change. The stream is a key process in the climate of western Europe, bringing heat northwards from the tropics and keeping countries such as the UK 4-6C warmer than they would otherwise be. 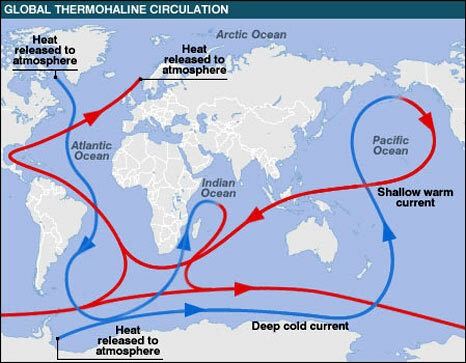 It forms part of a larger movement of water, the Atlantic Meridional Overturning Circulation, which is itself one component of the global thermohaline system of currents. The first observations suggesting the circulation was slowing down emerged in 2005, in research from the UK's National Oceanography Centre (NOC). Using an array of detectors across the Atlantic and comparing its readings against historical records, scientists suggested the volume of cold water returning southwards could have fallen by as much as 30% in half a century - a significant decline. The surface water sinks in the Arctic and flows back southwards at the bottom of the ocean, driving the circulation. However, later observations by the same team showed that the strength of the flow varied hugely on short timescales - from one season to the next, or even shorter. But they have not found any clear trend since 2004. The NOC team now has a chain of instruments in place across the Atlantic, making measurements continuously. "In four-and-a-half years of measurement, we have found there is a lot of variability, and we're working to explain it," said NOC's Harry Bryden. The quantities of water involved are huge, varying between four million and 35 million tonnes of water per second. The array is part of the UK-funded Rapid project, which aims to refine understanding of potentially large climate change impacts that could happen in short periods. Professor Bryden's team calculates that their system is good enough to detect a long-term change in flow of about 20% - but it has not happened yet. He believes the JPL approach - using satellite altimeters, instruments that can measure sea height precisely, and the Argo array of autonomous floating probes - could potentially add useful data to that coming from long-term on-site monitoring arrays. But, he points out: "The method concentrates only on the upper [northward] flow - it doesn't give you much information on the returning flow southward." Driven by Hollywood, a popular image of a Gulf Stream slowdown shows a sudden catastrophic event driving snowstorms across the temperate lands of western Europe and eastern North America. That has always been fantasy - as, said Josh Willis, is the idea that a slow-down would trigger another ice age. "But the Atlantic overturning circulation is still an important player in today's climate," he added. "Some have suggested cyclic changes in the overturning may be warming and cooling the whole North Atlantic over the course of several decades and affecting rainfall patterns across the US and Africa, and even the number of hurricanes in the Atlantic." The Secret Big-Money Takeover of America - "No representation without DONATION"! Map if US Foreclosures - "Lawyers, guns, and money." MOTHER JONES: Who Owns Congress? "Let's look at the chart!" "Meet the NEW Boss...same as the OLD Boss..."